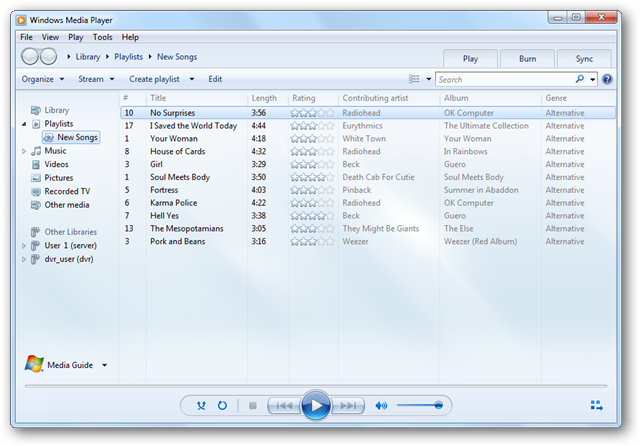 Are you getting tired of the same old playlists in Windows Media Player? 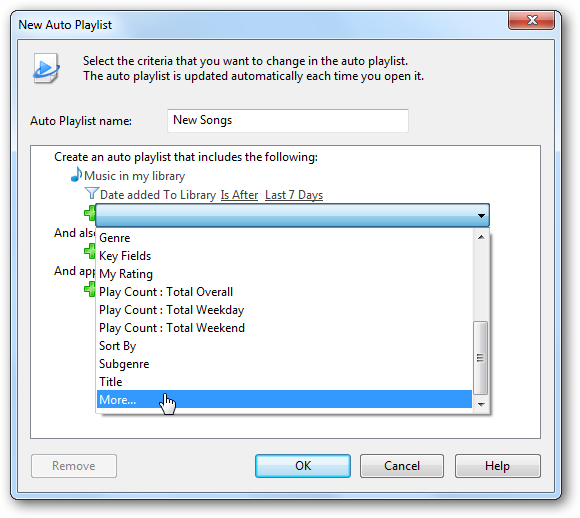 Today we’ll show you how to create dynamic auto playlists based on criteria you choose in WMP 12 in Windows 7. 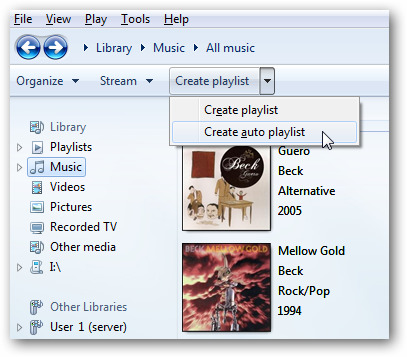 In Library view, click on Create playlist dropdown arrow and select Create auto playlist. 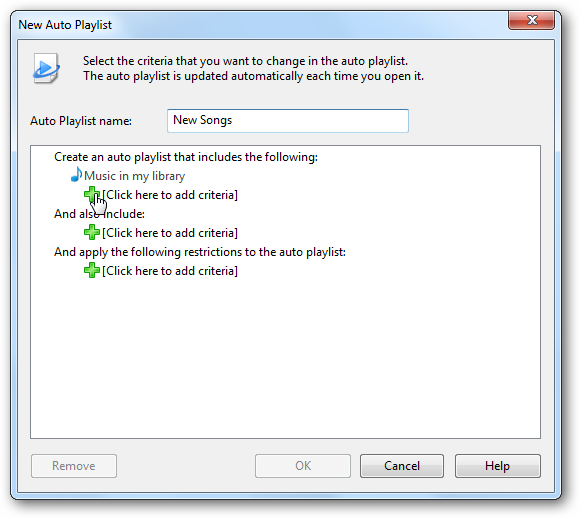 On the New Auto Playlist window type in a name for the playlist in the text box. 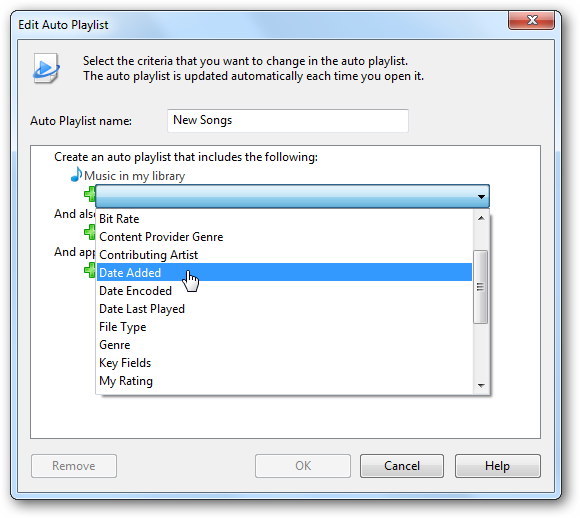 Now we need to choose our criteria by which to filter your playlist. Select Click here to add criteria. For our example, we will create a playlist of songs that were added to the library in the last week from the Alternative genre. So, we will first select Date Added from the dropdown list. Many criteria will have addition options to configure. In the example below you will see that we have a few options to fine tune. 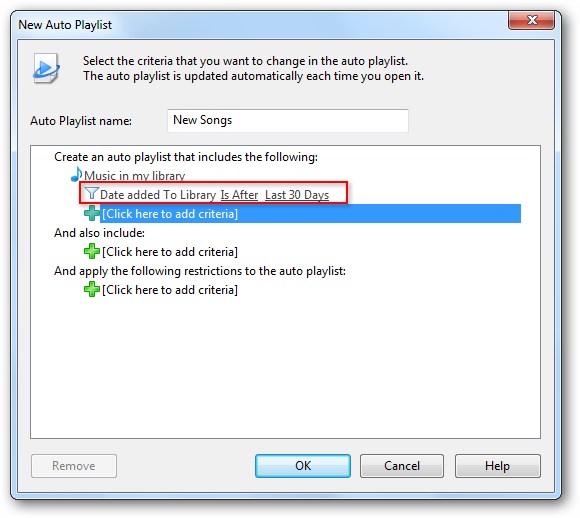 We will filter all the songs added to the library in the last 7 days. We will select Is After from the first dropdown list. Then select Last 7 Days from the second dropdown list. 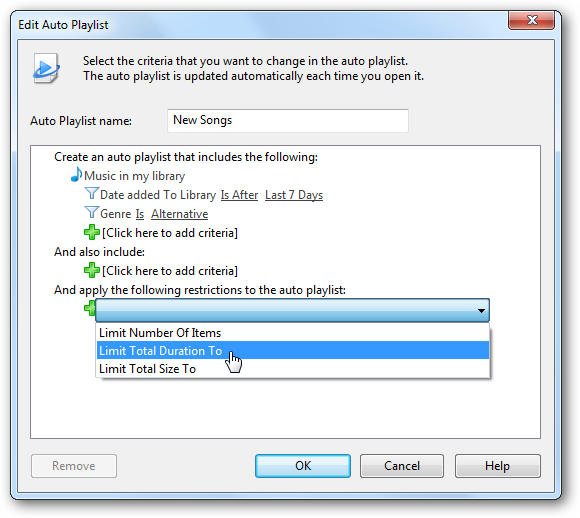 You can add multiple criteria to further filter your playlist. If you can’t find the criteria you are looking for, select “More” at the bottom of the dropdown list. This will pull up a filter window with all the criteria. Select a filter and then click OK when finished. 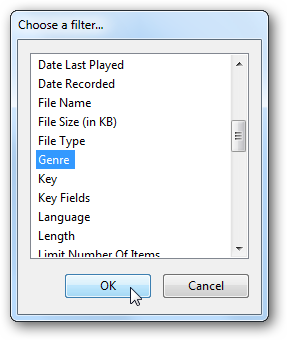 From the Genre dropdown, we will select Alternative. 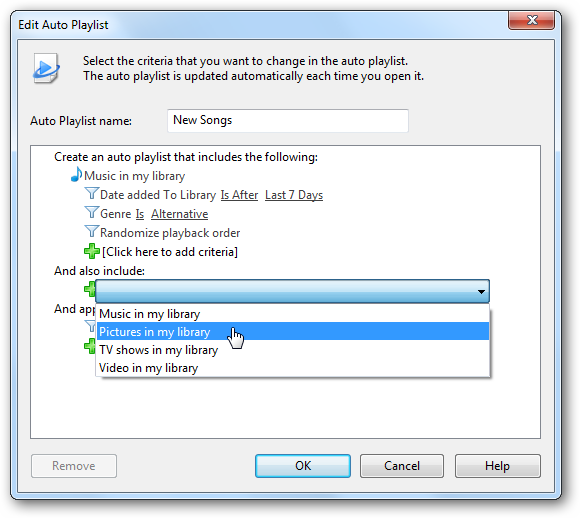 If you’d like to add Pictures, Videos, or TV Shows to your auto playlists you can do so by selecting them from the dropdown list under And also include. You will then be able to select criteria for your pictures, videos, or TV shows from the dropdown list. Then type in 1 hour…Click OK.
Our library is automatically filtered and a playlist is created based on the criteria we selected. 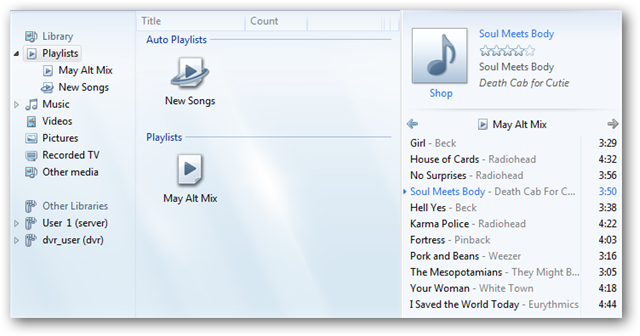 When additional songs are added to the Windows Media Player library, any of new songs that fit the criteria will automatically be added to the New Songs playlist. 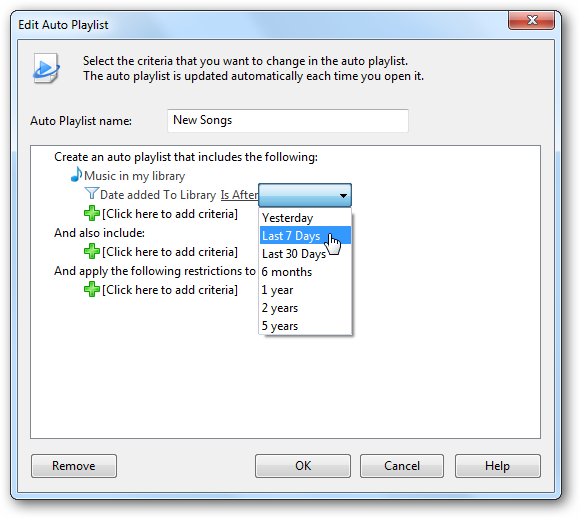 You can also save a copy of an auto playlist as a regular playlist. 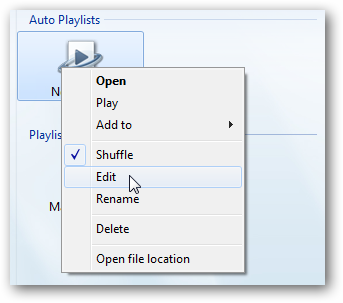 Switch to Playlists view by clicking Playlists from either the top menu or the navigation bar. 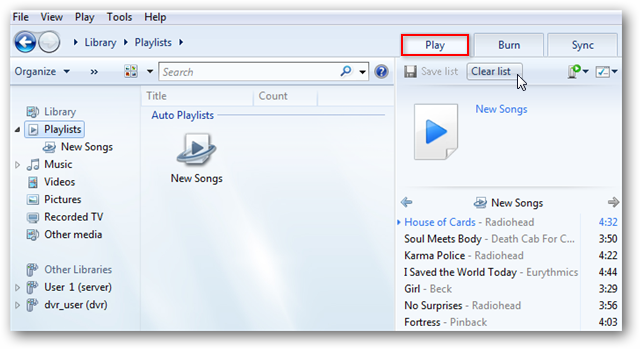 Select the Play tab and then click Clear list to remove any tracks from the list pane. 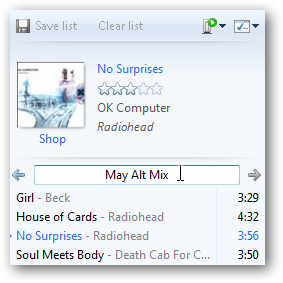 Right-click on the playlist you want to save, select Add to, and then Play list. 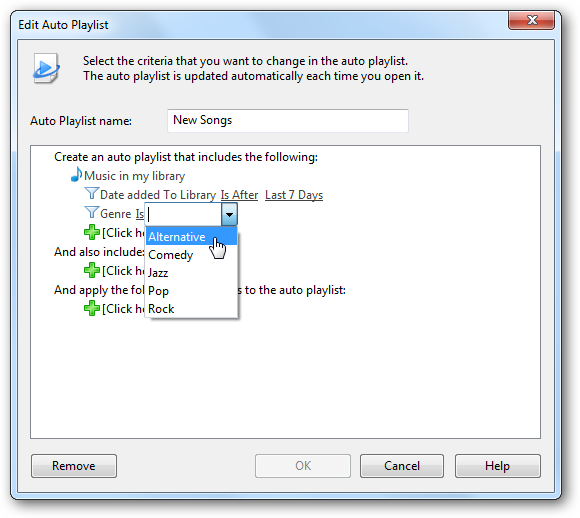 The songs from your auto playlist will appear as an Unsaved list on the list pane. Click Save list. Type in a name for your playlist. 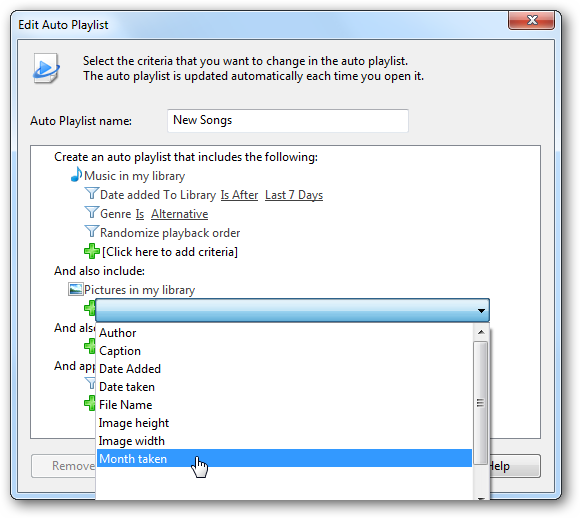 Your auto playlist will continue to change as you add or remove items from your Media Player library that meet the criteria you established. 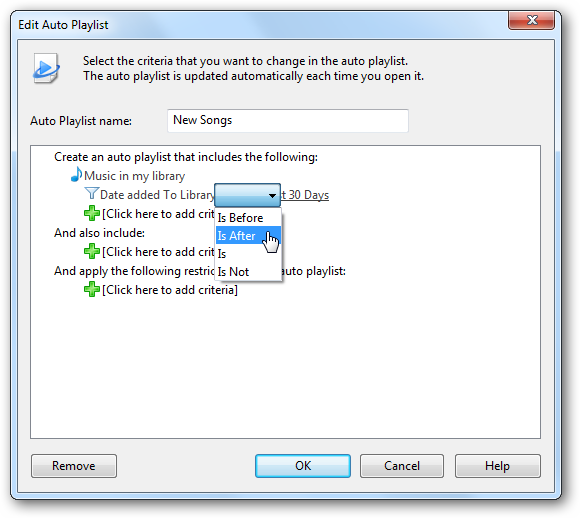 The new saved playlist we just created will stay as it is currently. Editing a Auto playlist is easy. 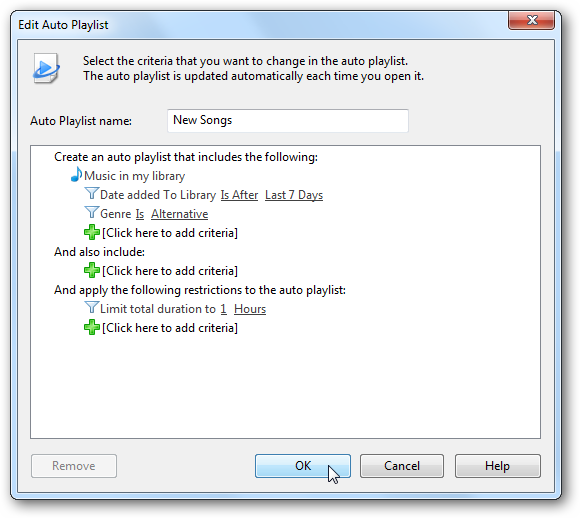 Right-click on the playlist and select Edit. Now you are ready to enjoy your playlist. 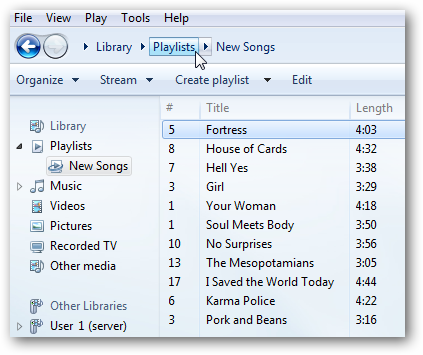 Auto playlists are great way to keep your playlists fresh in Windows Media Player 12. 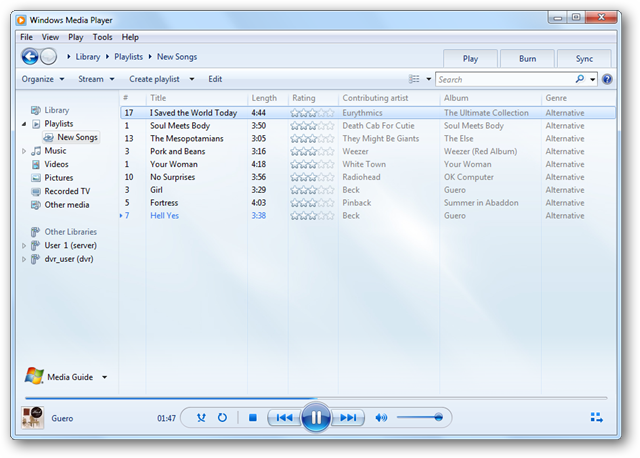 Users can get creative and experiment with the wide variety of criteria to customize their listening experience. 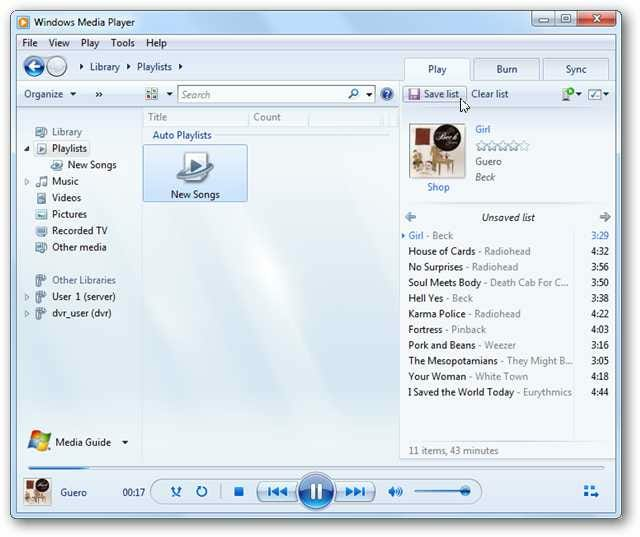 If you are new to playlists in Windows Media Player, you may want to check our our previous post on how to create custom playlists in Windows Media Player 12. Are you looking to get better sound from WMP 12? 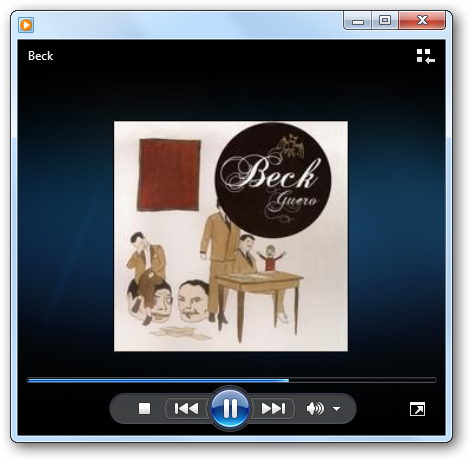 Take a look at how to improve playback using enhancements in Windows Media Player 12.